Walsall right-back Nicky Devlin has spoken ahead of Good Friday's League One six-pointer between the Saddlers and Southend United and admitted that the clash between two struggling sides is a must-win as the opportunities to edge out of the relegation zone continue to dwindle. The struggling Saddlers head into this Friday's clash on the back of last weekend's defeat to Accrington Stanley, having lost each of their last six outings and sit just one place off the bottom of the table, three points from safety with just four games remaining. "If we don’t win that, then there is not really much hope. With how close the three teams are, next weekend is definitely going to decide the fate of the club." Whilst opponents Southend United, who are currently managed by Kevin Bond following the sacking of Chris Powell, sit just a place and a point above Walsall, having failed to secure a victory since January, with a run of fourteen winless games guiding them towards the clash with Martin O'Connor's men. Nicky, who was speaking via the Express & Star, admitted that Southend will be heading into the clash looking to take advantage of the Saddlers recent woes as they look to halt their own poor run of form, going on to agree that a defeat could well see the Saddlers all-but relegated. Nicky said; "They will be going into the game thinking if they could pick a team in the division to play, it would probably be us. Maybe we are the same with them. I don’t think it’s going to be a very pretty game but it is one we just have to win. "That is a cup final, there is no other way to say it. If we don’t win that, then there is not really much hope. With how close the three teams are, next weekend is definitely going to decide the fate of the club." Martin O’Connor, who took interim charge of the Saddlers after club legend Dean Keates was sacked earlier in the month, refused to hide his anger following last Saturday'd dismal display against Accrington, even going as far as accusing his players of a lack of fight and desire. 25-year-old Devlin, who, if selected, will be making his 46th appearance of the season on Good Friday, believes he and his team-mates can have no complaints after being berated by the boss and a section of their own fans, this despite Nicky grabbing the Saddlers' only goal of the game to send the sides in level at the break. 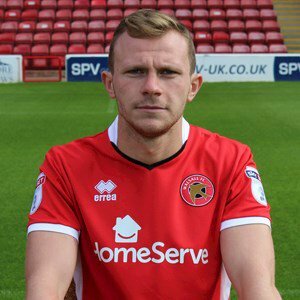 Nicky, who joined the Saddlers from Ayr United in the summer of 2017, continued; "We were getting a bit of stick from the fans, which was deserved. We didn’t turn up for them, like they have turned up for us - in their numbers. "What they were saying was probably true, at Accrington we probably weren’t fit enough to wear the jersey. That is something, individually, we have all got to look at. It’s been said so many times after games this year, it’s just not good enough. "I think a lot of times when a new manager comes in you kind of get that wee bounce but it didn’t happen for us. There was no point in the game when we looked good, when we looked like we were going to score, when we looked threatening. It was a really bad day, from start to finish and there has been far too many of them."